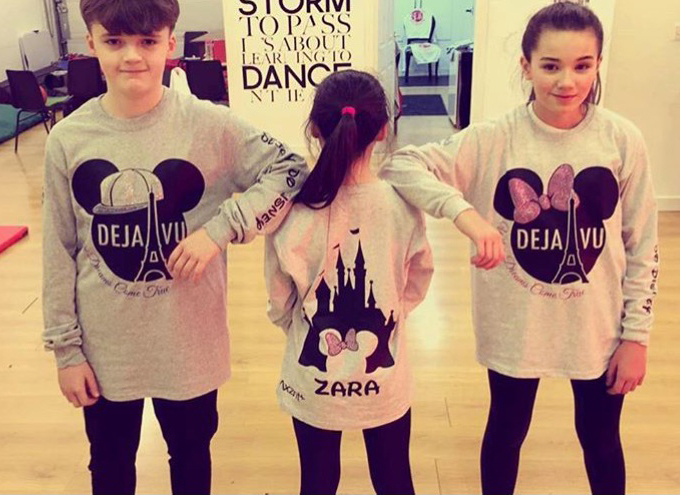 Deja Vu Dance crew run and Choreographed by Vicki Williamson is no stranger to the street dance circuit and even to the TV (BGT) and we always have the pleasure of helping Vicki get the madness out of her brain onto clothing! We commend Deja Vu for the amount of none stop energy they put into their dance, community and family! Their energetic personality can be seen through their dynamic performance pieces but also by what they wear. 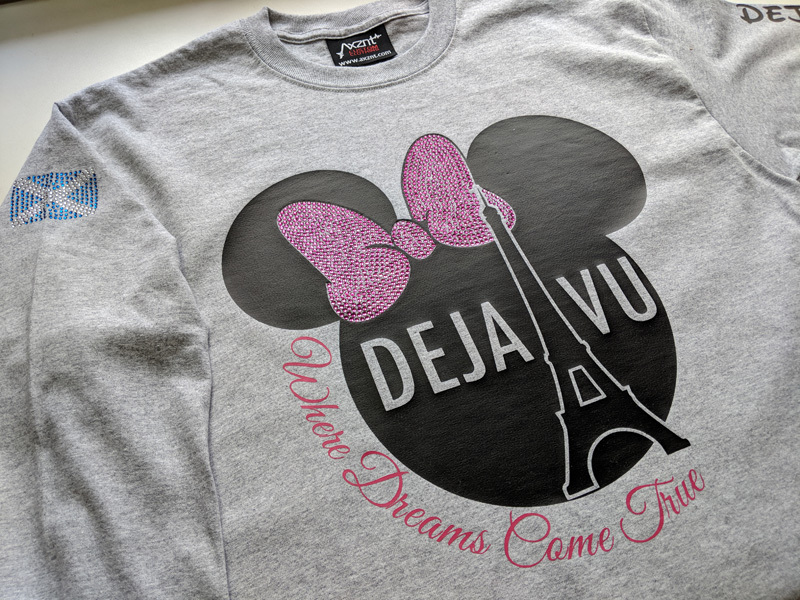 We love working with Deja Vu and Vicki because of the forever changing ideas – They are never the same and always willing to push that little bit further to make the pieces unique. 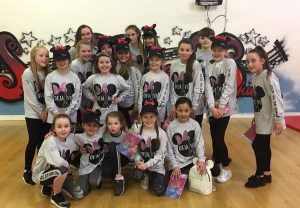 At the beginning of the year Deja Vu Dance Crew were heading over to Disneyland Paris to enter a new circuit, totally stepping out of their comfort zone and brazing a new audience. We needed to fix them up! Matching the front we had a smaller Minnie but could out of the back drop of the Disney Castle nice and big on the back. Everybody had theirs personalised, even Grandmas and Uncles! 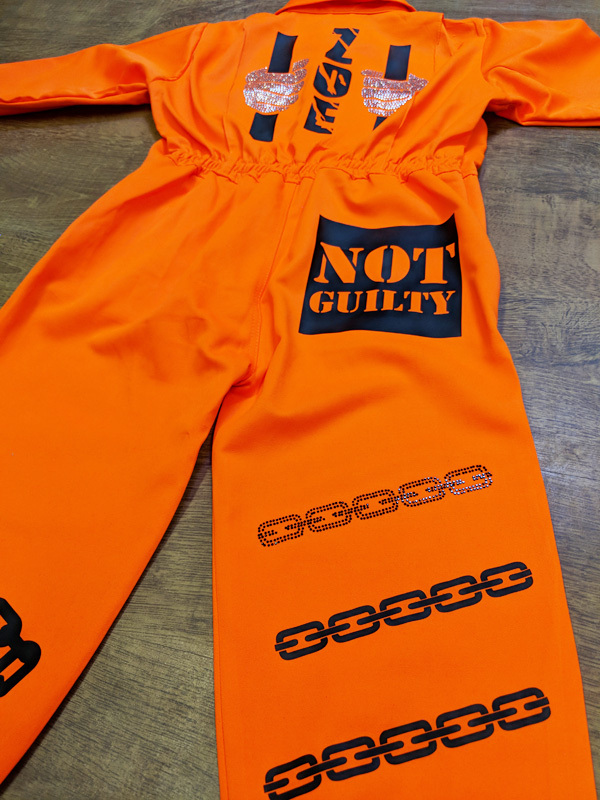 Along with that, a suspicious package arrived at the shop and in it was this bright orange jump suit. At this point nobody had mentioned sending anything down so it went on the shelf until Vicki said “Oh I’m sending a suit down that needs customising”, I immediately replied with a picture captioning “Do you mean this one? ?” Ha. Anyway, the ORIGINAL brief I got for this was “Right go wild!!! !” No joke – I have proof in my Whatsapp. 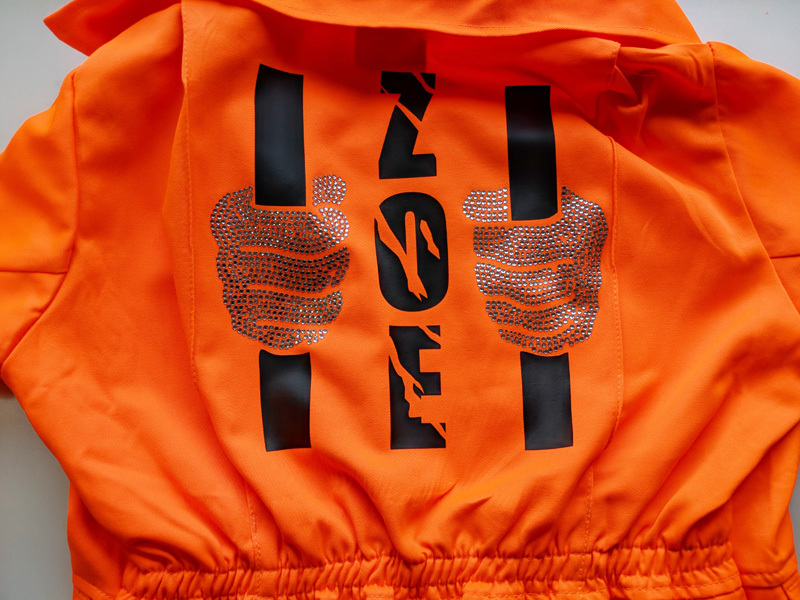 When I asked for better direction I got a couple of words… Zoe, Deja Vu, Inmate, 001, Jailbird, Not Guilty and Locked up. “Cool” I said, and went to work. 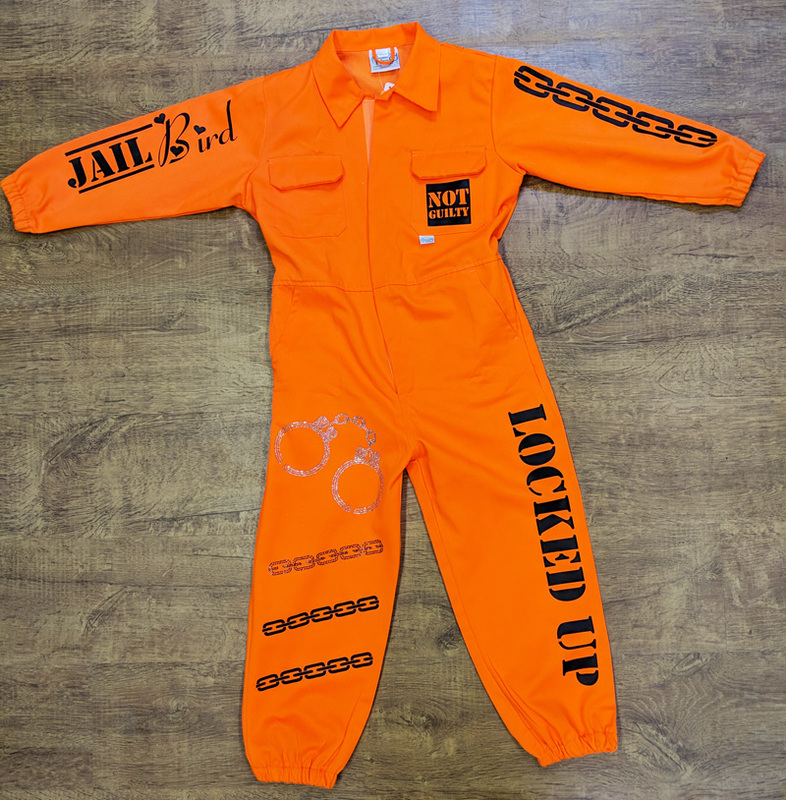 Because this was a solo piece we thought it only to be right that the Dancers name was included, and by putting it behind bars it gave a sense that it was actually her. I decided to put the fists in rhinestones to give it more of a dynamic 3D effect. 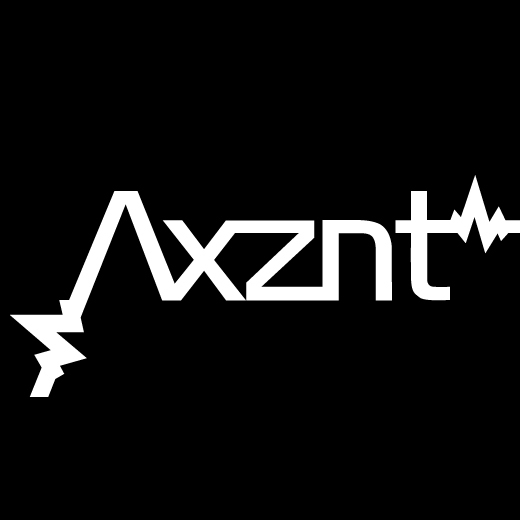 The rest of the back was done in Black Vinyl as it has the most contrasting impact against Fluorescent Orange. The change on the leg included Jet rhinestones. 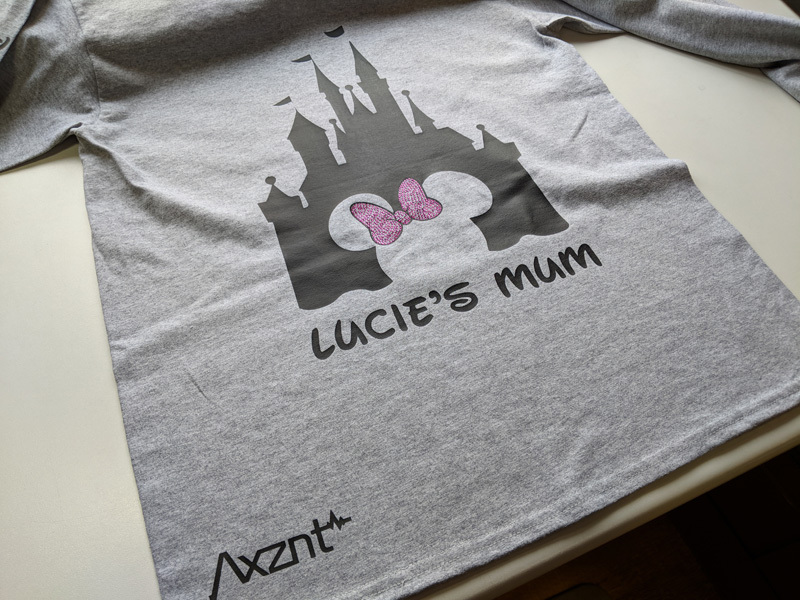 The front was brought together with bold text and print to make a statement with a touch of crystal to tie in with the back. The Chains on the leg were strategically placed to give the effect that they were wrapped around the leg from the back. 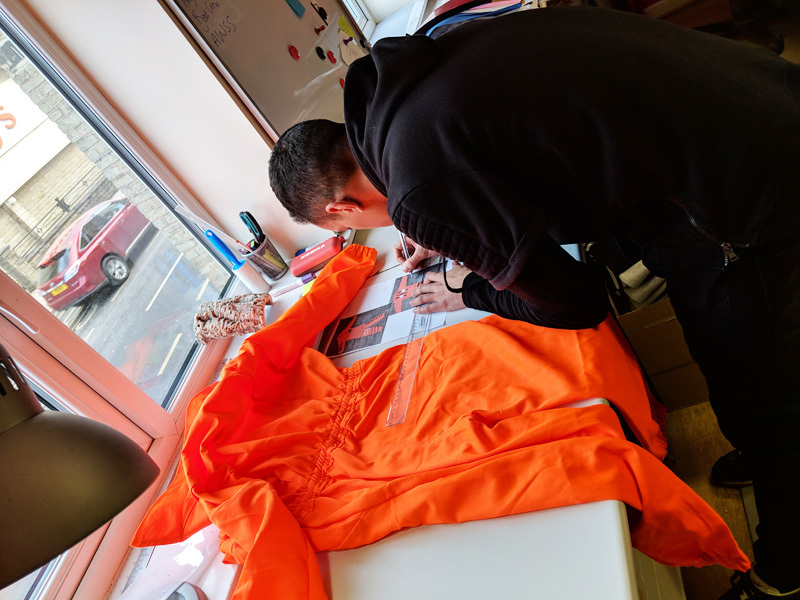 Needless to say that we enjoy doing these crazy pieces one off pieces, although time consuming and sometimes expensive, when working closely with the customer we can create something that they are 110% happy with and with the quality of materials used, the garment will outlast the needed use so therefore holds it’s value. Don’t be afraid of trying something different like Deja Vu!